Avro Vulcan (uradno Hawker Siddeley Vulcan je štirimotorni reaktivni strateški bombnik, ki ga je uporablja RAF v letih 1956−1984. Letalo so zasnovali pri podjetju A.V. Roe and Company (Avro), glavna konstruktorja sta bila Roy Chadwick in Stuart Davies. Zgradili so tri V-bombnike: Vickers Valiant, Handley Page Victor in Avro Vulcan. Pri konstruiranju so uporabljali tehnologijo iz Avro 707. Prva dobava je bila leta 1956, dobave izboljšanih Vulcan B.2 so sledile leta 1960. B.2 je imel močnejše motorje, večje krilo, ECM, izboljšane elektronske sisteme in možnost oborožitve z raketo Blue Steel. Avro Vulcan je bil najpomembnejši britanski jedrski strateški bombnik, je pa nosil tudi konvencionalne bombe, npr. v Vojni na Falklandih. Vulcan ni imel orožja za samoobrambo, zanašal se je n a visokohitrostne lete na visoki višini. Zgradili so tudi verzijo K.2 leteči tanker, za prečrpavanje goriva v zraku. ↑ "Hawker Siddeley Vulcan B2". National Cold War Exibition. Trustees of the Royal Air Force Museum. Pridobljeno dne 24 July 2013. ↑ "Hawker Siddeley Aviation Ltd." Flight, 29 August 1963, p. 342. ↑ Polmar and Bell 2004, p. 264. ↑ Laming 2002, pp. 155, 182. ↑ 5,0 5,1 5,2 Blackman 2007, p. 213. Austin, Steve. "Workhorse (V-Bombers: Test-bed Vulcan)." FlyPast, No. 335, June 2009, pp. 108–113. Baxter, Alan. Olympus: The First Forty Years. Derby, UK: Rolls-Royce Heritage Trust, 1990. ISBN 978-0-9511710-9-7. Blackman, Tony. Vulcan Test Pilot: My Experiences in the Cockpit of a Cold War Icon. London: Grub Street, 2007. ISBN 978-1-904943-88-4. Braybrook, Roy. Battle for the Falklands: Air Forces. Oxford, UK: Osprey Publishing, 1982. ISBN 0-85045-493-X. Brookes, Andrew and Chris Davey. Vulcan Units of The Cold War (Osprey Combat Aircraft: 72). Oxford, UK: Osprey Publishing, 2009. ISBN 978-1-84603-297-4. Bull, Stephen. Encyclopedia of Military Technology And Innovation. Santa Barbara, California: Greenwood Publishing Group, 2004. ISBN 978-1-57356-557-8. Buttler, Tony. 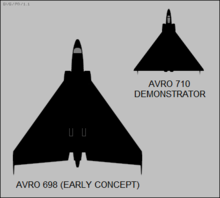 "Avro Type 698 Vulcan (Database)." Aeroplane, Vol. 35, No. 4, Issue No. 408, April 2007. Buttler, Tony. British Secret Projects: Jet Bombers Since 1949. Hinckley, Leicestershire, UK: Midland, 2003. ISBN 1-85780-130-X. Buttler, Tony. "Vital Bombers: Origins of the RAF's 'V-Bomber' Force". Air Enthusiast, No. 79, January/February 1999, pp. 28–41. ISSN 0143-5450. Darling Kev. Avro Vulcan. North Branch, USA: Speciality Press, 1999. ISBN 1-58007-023-X. Darling, Kev. Avro Vulcan, Part One (RAF Illustrated). Vale of Glamorgan Wales, UK: Big Bird Aviation Publication, 2007. ISBN 978-1-84799-237-6. Fildes, David. "Buck Rogers in the 20th Century: The Origins of the Vulcan." Aeroplane, Vol. 36, No. 3, Issue No. 419, March 2008. Frawley, Gerard (2002). The International Directory of Military Aircraft. Aerospace Publications Pty Ltd. ISBN 1-875671-55-2. Gallop, Alan. Time Flies: Heathrow At 60. Stroud, UK: Sutton Publishing, 2005. ISBN 0-7509-3840-4. Gunston, Bill. "The V-bombers: Avro Vulcan - Part 3". Aeroplane Monthly, Vol. 8, No. 12, December 1980, pp. 620–626. ISSN 0143-7240. Halpenny, Bruce Barrymore. Avro Vulcan: The History and Development of a Classic Jet. Barnsley, South Yorkshire, UK: Pen & Sword Aviation, 2006. ISBN 1-84415-426-2. Hamilton-Paterson, James. Empire of the Clouds: When Britain's Aircraft Ruled the World. London: Faber & Faber, 2010. ISBN 978-0-571-24794-3. Hearn, Chester G. Carriers in Combat: The Air War at Sea. London: Stackpole Books, 2007. ISBN 0-8117-3398-X. Jackson, A.J. (1990). Avro Aircraft since 1908 (2 izd.). London: Putnam Aeronautical Books. ISBN 9780851778341. Jackson, Paul. "Vulcan: Delta Force". Wings of Fame, Volume 3. London: Aerospace Publishing, 1996. pp. 34–95. ISBN 1-874023-70-0. ISSN 1361-2034. Jackson, Robert. Combat Aircraft Prototypes since 1945. New York: Arco/Prentice Hall Press, 1986. ISBN 0-671-61953-5. Jefford, C.G. (2001). RAF Squadrons, a Comprehensive Record of the Movement and Equipment of all RAF Squadrons and their Antecedents since 1912. (2 izd.). Shrewsbury, Shropshire, UK: Airlife Publishing. ISBN 1-84037-141-2. Jenkins, Dennis R. B-1 Lancer: The Most Complicated Warplane Ever Developed. New York: McGraw-Hill, 1999. ISBN 0-07-134694-5. Jones, Barry. V-Bombers: Valiant, Victor and Vulcan. Ramsbury, UK: The Crowood Press, Paperback edition, 2007. ISBN 978-1-86126-945-4. Jones, Barry. "Black Buck - The Swansong." Aeroplane, Vol. 35, No. 4, Issue No. 408, April 2007. Kingsley, Simon and Shaun Quegan. Understanding Radar Systems. Raleigh, North Carolina: SciTech Publishing, 1999. ISBN 1-891121-05-7. Lake, Alan (1999). Flying Units Of The RAF. London: Airlife Publishing Ltd. ISBN 9781840370867. Laming, Tim. The Vulcan Story: 1952-2002, Second Edition. Enderby, Leicester, UK: Silverdale Books, 2002. ISBN 1-85605-701-1. Leitch, Andy. "V Force Arsenal: Weapons for the Valiant, Victor and Vulcan". Air Enthusiast, No. 107, September/October 2003, pp. 52–59. ISSN 0143-5450. Polmar, Norman and Dana Bell. One Hundred Years of World Military Aircraft. Annapolis, Maryland: Naval Institute Press, 2004. ISBN 1-59114-686-0. Price, Alfred, Tony Blackman and Andrew Edmondson. Avro Vulcan Manual: An Insight into Owning, Restoring, Servicing and Flying Britain's Legendary Cold War Bomber (Owner's Workshop Manual). Sparkford, Somerset, UK: Haynes, 2010. ISBN 1-84425-831-9. Richardson, Doug. Stealth Warplanes. North Branch, Minnesota: Zenith Imprint, 2001. ISBN 0-7603-1051-3. Seddon, J. and E. L. Goldsmith. Intake Aerodynamics (Aiaa Education Series). Reston, Virginia: American Institute of Aeronautics and Astronautics, 1999. ISBN 1-56347-361-5. Segell, Glen. Wither or dither: British Aerospace Collaborative Procurement with Europe. London: Glen Segell Publishers, 1997. ISBN 1-901414-03-5. Stephens, Alan. Power Plus Attitude: Ideas, Strategy and Doctrine in the Royal Australian Air Force, 1921-1991. Canberra, Australia: AGPS Press, 1992. ISBN 0-644-24388-0. Vulcan B.Mk.1A Pilot's Notes (AP 4505C–PN). London: Air Ministry, 1961. Vulcan B.Mk.2 Aircrew Manual (AP101B-1902-15). London: Air Ministry, 1984. Wansbrough-White, Gordon. Names With Wings: The Names & Naming Systems of Aircraft & Engines Flown by the British Armed Forces 1878-1984. Shrewsbury, UK: Airlife Publishing Ltd, 1995. ISBN 1-85310-491-4. White, Rowland. Vulcan 607: The Epic Story of the Most Remarkable British Air Attack since WWII. London: Bantam Press, 2006. ISBN 0-593-05391-5. Willis, David. "Avro Vulcan survivors." Aeroplane, Vol. 35, No. 4, Issue No. 408, April 2007. Wilson, Stewart (1989). Lincoln, Canberra and F-111 in Australian Service. Weston Creek, ACT, Australia: Aerospace Publications. ISBN 9780958797832. Wynn, Humphrey. RAF Strategic Nuclear Deterrent Forces: Origins, Roles and Deployment 1946-1969. London: The Stationery Office, 1997. ISBN 0-11-772833-0.